Cami's hair has grown SO much! 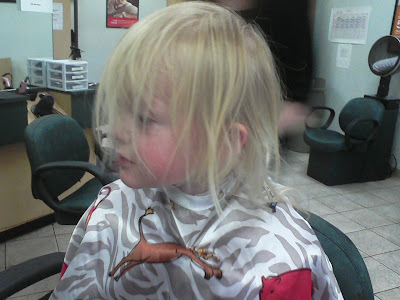 So yesterday I decided that I was going to get it cut, no matter how hard it was on her (& me!). The thought that she wouldn't have the natural curl, just broke my heart... But as you can see, it needed to be cut! I was so worried she wouldn't hold still. 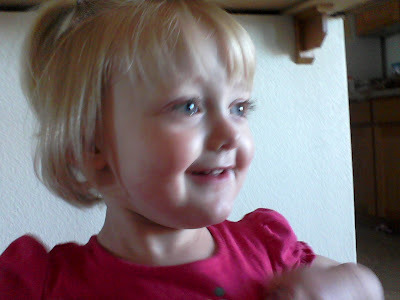 I have cut her bangs before, and she has the hardest time with it. But she just sat there, and let the lady cut it. The entire time she was getting it cut, Grant would say, "Cami are you so excited?? 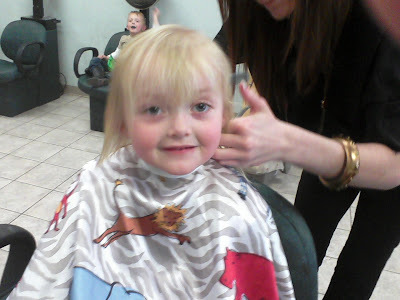 It's your first hair cut". When she was almost done, he told her in front of all the ladies, "I am so proud of you Cami, you're doing it!!" Yes, he is a great big brother, and he does love his sisters!! The finished product... It's growing on me! I will have to get use to her not having curl. But I am proud of her!!! She looks so cute! Can't believe how big she is getting.